Joseph Mua Vang Sang and his seven-member family gather in front of an altar set up inside their home in northern Vietnam and recite prayers and the Holy Rosary in their native Hmong language every day after dinner. His parents and mother-in-law also join their evening prayer sessions, which are a long-established tradition in this and other Hmong households in Van Chan district of Yan Bai province. "We've had all of our children baptized at our local church," Sang said. "Then we teach them how to make the sign of the cross, recite Our Father before meals and say their daily prayers before going to sleep." His youngest child is just a year old while his oldest is 17. The four eldest daughters have already received their first communion and confirmation. 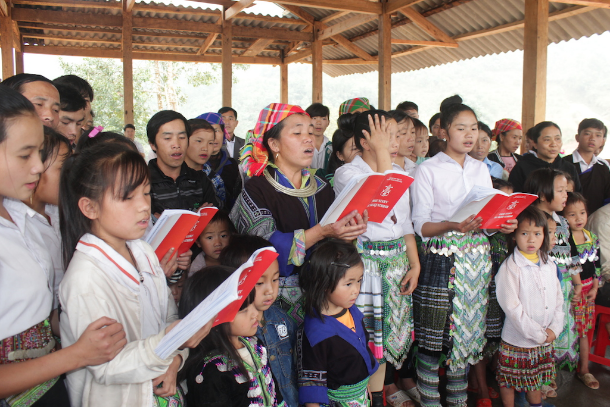 They are also part of a choir led by Sang's wife at their home near Ngon Lanh chapel, which serves 200 ethnic Hmong Catholics in this remote region. "We try to teach our children the kind of faith-based practices we learned from our parents, who went through decades of hardship that saw many restrictions imposed on their religion," said Sang, 37, who serves as a member of the subparish council. His parents were among 20 Hmong Catholics who settled in this area in 1993 and converted to Catholicism. They were illiterate but managed to learn church prayers and the Rosary by heart, Sang said. "When I was three, they taught me how to make the sign of the cross before meals and before going to sleep. I started to recite the Rosary when I was five," he added. He recalls saying the Rosary and singing hymns with his three siblings in front of an altar on dark nights without any electricity. The children were encouraged to give thanks to God — "uo trau" in Hmong — for bringing them into the world and giving them good health, weather and crops. Sang's wife, Mary Ho Thi La, said their ancestors migrated over to the Catholic faith due to the influence of foreign missionaries. After this it was passed down from generation to generation. "So now we have a duty to teach it to our children," she said. La, who wears traditional ethnic clothes and is fluent in Hmong and Vietnamese, said in the past her family had to walk 15 kilometers to Vinh Quang church whenever priests visited the area to celebrate Mass. "I remember one time I walked there carrying my three-month-old baby. It was exhausting but still I was happy to be able to attend a Mass," she said. La conducts the choir and teaches catechism classes. She said most local people raise cattle and grow crops on hills for a living. Many suffer severe food shortages for about a quarter of the year, she added. The Hmong have been spreading their Catholic faith and keeping it alive in this region for decades with little if any help from priests, La said, adding that prayers are passed on orally to younger generations. The better educated among them teach prayers in Hmong to help preserve their culture and especially their written language, which was created by foreign missionaries. Hmong is not taught at public schools in Vietnam. Many wear rosaries around their necks to show their devotion to Mother Mary. From 2011, Catholics in the area started going to La's home on Sundays to say prayers together. They would also attend irregular Masses celebrated by visiting priests en masse, she said. However, the government did not recognize them as legitimate members of Ngon Lanh subparish until 2014. Now they see priests come from other parts of the country to hold Masses once or twice a month at their wooden church, which was built early this year on a 3,000 square meter plot of land. La said her family donated land and part of their home so that the church could be established. Now they make do by living in the kitchen. She said locals gather there to pray on weekends but pray at home on weekdays. In the summer, nuns and seminarians also teach catechism classes to children and help couples prepare for their nuptials. Sang said those Hmong who convert to Catholicism soon disavow old traditions like having shamans treat sickly patients or throwing lavish funerals. They are an especially tight-knit community who respect and help one another, and congratulate their neighbors on getting a new house, celebrating a wedding or giving birth, he said. Sang, a member of the subparish's evangelization group, said they also run programs to try and convert other people from different districts. As a result, 31 Hmong from neighboring Mu Cang Chay district were baptized last Easter. Dominican Sister Mary Cu Thi Huynh Hoa, a Hmong from Giang La Pan parish, said she was grateful to her parents for teaching her prayers and leading her to a religious vocation. Her mother is 83 but still visits villagers and shares her Catholic faith with them. Sister Hoa, 41, said local Hmong Catholics used to listen to Christian radio programs from abroad and quietly practice their faith at home without any aid from clergy since they migrated there in the 1960s until a priest was assigned to the area in 2003. Father Peter Phan Kim Huan, the pastor of Lai Chau parish, said 2,300 Catholics including 800 ethnic Hmong live in 15 communities in nearby Lai Chau province. He is forbidden by authorities from providing pastoral activities for 10 of those communities because the government does not recognize those communities. In July 2017, his parish offered catechism classes, living skills and accommodation to 60 Hmong children at the parish house. Father Huan said many were badly malnourished. Two other parishes from Dien Bien and Lao Cai provinces also hold summer programs and Hmong language courses for local children. Father Huan said local priests have dialog with government authorities and seek official approval to offer religious activities to communities that are not officially recognized by the government. Hung Hoa Diocese covers eight provinces in Vietnam including part of Hanoi, where scores of ethnic groups live. It serves 250,000 Catholics including 20,000 ethnic Hmong, Dao, Tay, Thai and Muong. They mostly live in mission stations and subparishes that don't have resident priests.